Below are the complete details of the Research Associate jobs in International Center For Chemical & Biological Sciences in Karachi. Skills Required for Job: Listening, Speaking and writing & Analytical and Problem solving skill. Communication. Attention to detail. Critical thinking. Statistical and Graphical Analysis of Data. Technical skills. Qualification: International Center For Chemical & Biological Sciences Jobs for Research Associate Qualification:- Candidates should be at least M.Sc, BS Degree Holders & Minimum Experience:-Preferably have Nil of working experience in the field interested candidates fulfilling the above criteria can apply at following address by 30 January 2019 incomplete documents/late application after due date will not be acceptable. 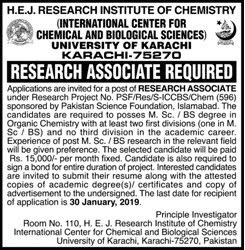 Research Associate jobs in International Center For Chemical & Biological Sciences Karachi, in Pakistan published on Paperpk.com from newspaper on January 08,2019. Job seekers who are already working as Research Associate , Research can also apply for post of Research Associate.